Wikipedia Venezuela posted a series of updates and explanations of what has been happening locally, and the editing war that appears to have triggered the block. Wikipedia became inaccessible for most Venezuelans on January 12, following a high-stakes conflict over the legitimacy of two dueling political leaders: President Nicolás Maduro and the National Assembly President Juan Guaidó. Reported by users and then confirmed by technical experts at Netblocks, the block was likely triggered by the inauguration of Nicolás Maduro. On January 11, Maduro began his second term as president, despite broad international condemnation of Venezuela’s 2018 presidential elections, in which popular opponents were banned from running. Shortly thereafter, opposition politician and National Assembly President Juan Guaidó threw himself into the political spotlight when he publicly denounced the legitimacy of Maduro’s re-election and proposed to take on presidential powers on the basis of a constitutional statute and call for new elections. In so doing, Guaidó effectively poured gasoline onto an already-blazing dumpster fire within Venezuela’s political crisis. This triggered sharp responses in public and online, and a bitter “editing war” between Venezuelan Wikipedia contributors, who were at odds over the same question: Who is (or should be) the legitimate leader of the country? In short order, Wikipedia became inaccessible on Venezuela’s most widely-used internet service provider (ISP), CANTV, which is effectively controlled by the government. 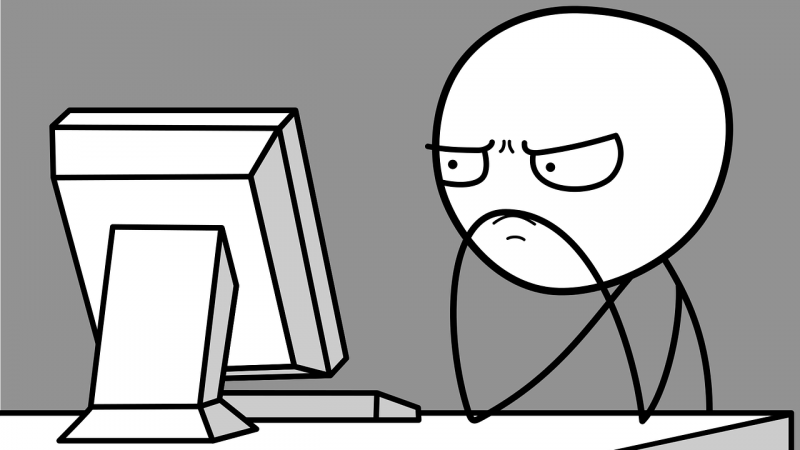 And by January 14, the site was back online. What makes a leader ‘fit to hold office’? The dispute that sparked the “editing war” started with Juan Guaidó’s proposal to invoke certain articles of the Venezuelan Constitution that stipulate what should be done if the President of the Republic is deemed incapacitated, or is not fit to hold office. According to Guaidó’s interpretation of the Constitution, he would be first in line to assume the Presidency of the Republic until free and fair elections could be held. Amid public calamity and outrage within the ruling government, Guaidó was arrested by Venezuelan Intelligence Services (SEBIN) two days later on January 13. He has since been released. Guaidó’s position is more complicated than it might sound. The 35-year-old politician is the new president of Venezuela’s National Assembly, traditionally the country’s highest-level legislative body. But Nicolás Maduro effectively dissolved the National Assembly in 2017, after opposition politicians claimed the majority of seats in 2015 elections, and created a new “Constitutional Assembly” in its place. This and other attempts to consolidate power led to violent protests that lasted for months and claimed the lives of around 100 people. Although the National Assembly remains active, its powers have been effectively absorbed by the Supreme Court of Justice, the Constitutional Assembly, and the Presidency since 2017. In 2018, Maduro was elected president through a process that opposition leaders, foreign governments and the Organization of American States (OAS) denounced as unfair and illegitimate. OAS Secretary General Luis Almagro later endorsed the proposal from Guaidó on Twitter. On January 12, Twitter users reported they were unable to access Wikipedia using CANTV, the country’s predominant internet service provider (ISP), which is majority-owned by the Venezuelan government. Users noted that they were able to access Wikipedia using Movistar, a privately-owned ISP. Technical evidence gathered by Netblocks, a non-profit group that runs technical tests for internet censorship, confirmed that the site was inaccessible via CANTV on January 12. Government-affiliated Twitter accounts have denied blocking Wikipedia, but no official statements have been issued on the matter. Venezuelan authorities have blocked access to news and information websites in the country on many occasions. But blocking Wikipedia — the world’s largest open knowledge and multilingual information resource made mostly by volunteers — would take the practice to a new level. Wikipedia’s unique structure played a key role in what led to the controversy. Unlike resources produced by professionalized experts, Wikipedia is built on the contributions of thousands of volunteers who write and update articles on the site. Volunteers have also built rigorous procedures for information verification and vetting, and works hard to prevent contributors from publishing inaccuracies. Wikipedia article for Juan Guaidó, as of January 15, 2019. The Wikimedia Foundation does not write, edit, or determine what content is included on Wikipedia or how that content is maintained – our volunteers do….contributions to the site must meet a series of volunteer-developed standards around neutrality and reliable sourcing. On January 11, Guaidó’s official title on his article page changed from “President of the National Assembly” to “President of the Republic” ten times in about two hours’ time. 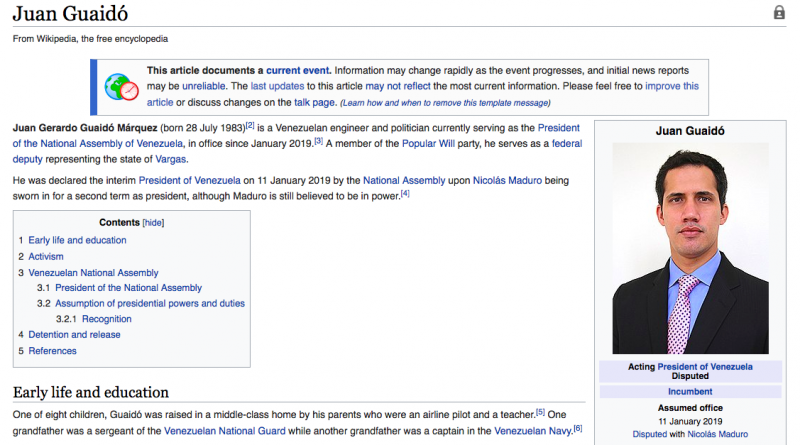 As their edits revealed, some Wikipedia contributors took an extreme view of Guaidó’s position, by actually referring to him as president. Others did not. Guaidó has not declared himself the president, but rather has proposed that he temporarily assume the role until free and fair elections can take place. Wikipedia swiftly moved to close the page for further edits, in an effort to quell the conflict and seek outside counsel on the matter. Wikipedia’s Venezuela team also tweeted an explanation of how the organization handles disputes at this level. Soon, the entire website was inaccessible via CANTV. Despite technical evidence of what has happened, politically-fueled rumors about the block have spread rapidly. Numerous accounts claimed — with no evidence — that Wikipedia supported Guaidó’s presidency. At the same time, many of those who outwardly support Nicolás Maduro have falsely claimed that Wikipedia was blocking requests from CANTV subscribers, something that would strongly contradict the mission of the Wikimedia Foundation, which denied the claim. Según los conspiranoicos chavistas: CANTV no bloqueó Wikipedia. Es al contrario Wikipedia bloqueó a CANTV. According to paranoid and chavista conspiracy theorists: CANTV didn’t block Wikipedia, but Wikipedia blocked CANTV. “Wikipedia censors Venezuela” is the chavista’s disinformative message. Ultimately, the Wikipedia dispute is just one manifestation of the broader conflict at play. Nicolás Maduro called Guaidó’s strategy a “Twitter coup” and a “Hollywood-esque show,” but that didn’t stop either the blocking of the world’s largest open information resource, or Guaidó’s arrest. For now, the President of the National Assembly is free, and as of January 14, Wikipedia appears to be accessible once again in most parts of the country. But the episode sends a message about how authorities can react when the legitimacy of the presidency is called into a question.